Lift pass chip case Look for the ‘around the arm’–type case to hold your pass. You will be scanning this at every lift, and the case attached to your arm is easily the best place to keep it. Goggles They’re very expensive in Japan, so it’s best to bring your own. Essential toiletries Sunblock, aspirin and other pharmacy items you’re used to may be hard to track down, so it’s best to bring your own favourites. Large-sized ski boots Rental places at most resorts have boots of up to 30cm (which is equivalent to men’s size 12 in the USA, UK or Australia). Resorts such as Niseko, which attract strong international followings, typically stock larger sizes. But if you have very large feet, play it safe and bring your own boots. Japan is home to more than 600 ski resorts, all of which offer regular snowfall, stunning mountain vistas, well-groomed runs, friendly locals, excellent food and an incredible variety of onsen (hot springs) for that all- important après-ski soak. Quite simply, Japan may be one of the skiing world’s best-kept secrets. As an added bonus, skiing in Japan is remarkably reasonable: it generally costs less to ski here than in comparable areas in North America or Europe. Finally, if you plan your itinerary accordingly, it’s possible to head from powdery slope to Zen garden with relative ease, allowing for one of the most exotic ski holidays imaginable. The ski season officially starts in December, though conditions are highly variable. During this time, resorts will intermittently open runs depending on the quality and quantity of snowfall. January and February are peak months across the country. Things begin to warm up in March, heralding the close of the ski season before the start of April. Many people unfamiliar with skiing in Japan often assume that it will cost an arm and a leg to ski here. But, even after factoring in the international air ticket, it might actually be cheaper to ski for a week in Japan than in your home country. Are we mad? Well, let’s check the numbers. » Lift tickets and equipment rental A full-day lift ticket at most ski areas in Japan costs between ¥4000 and ¥5500. This is significantly less than a full day at large resorts in North America or Europe. Many resorts also offer packages including lunch or even a dip in an onsen. Even if you don’t have your own equipment, full equipment rental is typically no more than ¥5000 per day (both ski and snowboard sets are available). The Japanese tend to be connoisseurs of quality, which means that you need not worry about getting stuck with shabby and/or outdated gear. » Accommodation You can find plenty of upmarket accommodation in the ¥6500 to ¥10,000 range at major ski areas in Japan, and this price will often include one or two meals. This is often less than half of what you’d expect to pay for similar accommodation in the USA or Europe. The budget traveller will find a variety of backpacker-type hostels near most resorts, and families will be glad to know that young children (under six years of age) can usually stay for free or at a significant discount. » Food On-slope meals top out at around ¥1000, which is slightly less than what you’d pay in North America or Europe. The restaurant selection anywhere you go is also varied, including the likes of rāmen (egg noodles), udon (wheat noodles), curry-rice and beef bowls, as well as more familiar fast-food options including sandwiches, pizza, burgers and kebabs. Beer and snacks, however, can be quite expensive – better to bring your own rather than buy from one of the ubiquitous convenience stores. » Transport Airport-to-resort transport in Japan costs no more than in other countries, and is usually faster and more efficient (and, unlike in North America, you don’t need to rent a car). 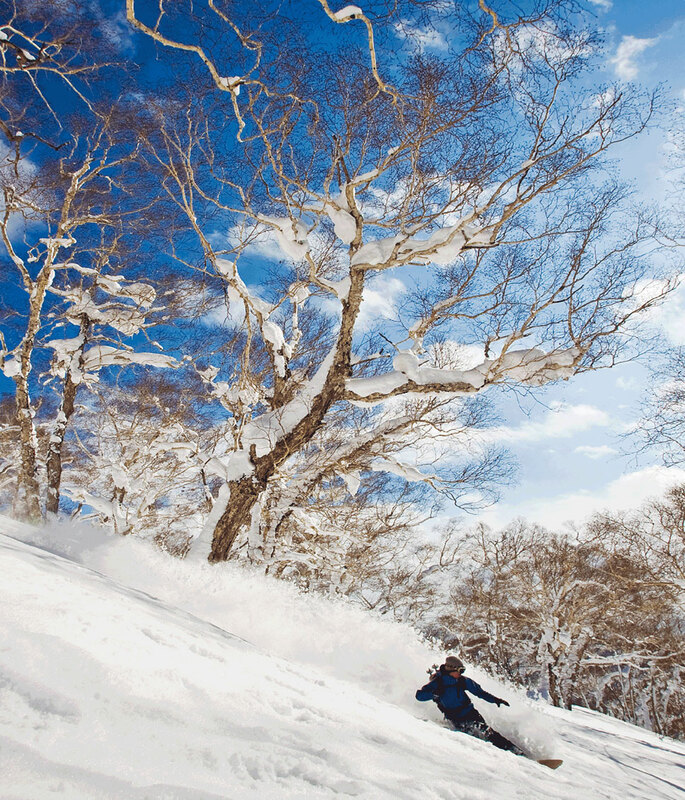 » Hokkaidō’s Niseko ski area receives a whopping 15m of snow every year. » More than two-thirds of foreign skiers at Niseko come from Australia. » The first Winter Olympics held outside Europe or North America was at Sapporo in 1972. » Snowboarding first debuted as an Olympic sport at the 1998 Nagano Winter Olympics. » Naeba is home to the world’s longest ski lift, the ‘Dragondola’ (5.5km). Japan’s best ski resorts are found in the Japan Alps region of Central Honshū, and on the northern island of Hokkaidō. The former lays claim to the highest mountains, while the latter boasts the deepest and most regular snowfall in the country. Although the ski resorts of Northern Honshū were not directly affected by the Great East Japan Earthquake, it remains to be seen whether or not they will open to full capacity during the life cycle of this edition. If you’re planning on doing a bit of sightseeing in Tokyo, Kyoto and Hiroshima, the ski resorts in the Japan Alps are a quick and convenient add-on. Niseko and Furano on the island of Hokkaidō might be the way to go if your main goal is Sapporo. To be fair, however, Japan’s small size and excellent infrastructure means that the difference is really only one quick internal flight. What follows is our overview of the five best ski areas in Japan. This is just to whet your appetite, of course, as there are over 600 more that we don’t mention here!